Part of an occasional series exploring North America’s national, provincial and state parks. When you ask people for travel recommendations, you’ll mostly get answers similar to what the region’s tourism bureau would tell you: popular art museums, science centres, overpriced “adventures” where you’ll find yourself shoulder to shoulder with families who seek out attractions in far-away cities that are exactly like attractions in the cities they’ve come from. We arrived at Beacon Hill Park a little before the goat stampede. The “zoo” isn’t very big, but there’s a lot to see — a donkey, some tired alpacas, plenty of ducks and peacocks cruising the paths like they own them. “Like a cat?” I suggested, but she didn’t answer me. Jillian got a step or two closer to the peacock and it walked away from her, lazily, and not unlike a cat. We give the Beacon Hill petting zoo a coveted four out of four completely arbitrary stroller wheels. There are staff everywhere, including a poop crew in the goat pen — they’re unobtrusive but ready to answer questions. In addition to the goats (when we were there, there were 21 kids and more on the way) and peacocks, there are pigs, alpacas, a donkey and miniature horse, a couple of budgies, and dozens of ducks. The entrance to the zoo within Beacon Hill is by donation, making it accessible to everyone (be generous when you can; it’s for the kids, after all). Parking is free for three hours. 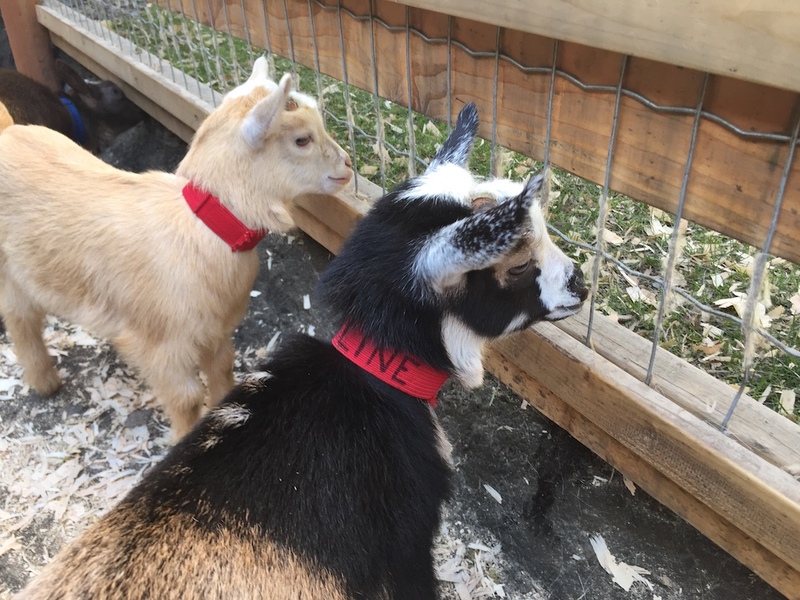 The petting zoo is open from 10 to 4 daily, with goat stampedes at 10:10 and 4:10. For more information, check out beaconhillpark.com.